If you are not familiar with Alex Loos, please know that she was an accomplished athlete and student as well as a genuinely kind and giving person. Sadly Alex was struck and killed by a speeding car in August of 2004 as she and a friend were walking home from Bentworth High School following a session of soccer conditioning. She was 15. Not only was Alex 1 of 2 girls on a high school boys soccer team (Bentworth did not have a girls soccer team), she was a starter and letterman as a freshman. To see this determined 5’2″ blonde girl hold her own on a soccer field with young men substantially larger was nothing less than remarkable. Also, the first year Alex ever ran track she set a WPIAL record in the 1600m and placed third in this event at the Pennsylvania Track and Field Championship. This is an ongoing story of Alex feel free to add comments or memories about Alex. Alex was born Sept 2, 1988 to James & Cathy Loos. At the time she had one big sister Jaminique. Naturally she was beautiful with strawberry blonde hair and blue eyes. One of the first things I remembered was when she opened her mouth and stuck her tongue it was so long it touched her chin. After having Jaminique we were expecting the same with Alex, but instead of never wanting to sleep like Jaminique she was very easy. Alex welcomed her brother Colton into her family. Just 2 years and 3 days apart they did many things together. Alex entered pre-school at Thomas Presbyterian. Alex entered kindergarten school. She was also involved in Brownies. Alex was in Mrs. Magyars 1st grade class. Alice Magyar noticed Alex’s remarkable gift of learning and recommend that she be tested for gifted. She did not pass the gifted test but that only goes to show that test don’t tell all. Alex came home with a pamphlet for soccer sign-ups. Not know anything about soccer we had no idea what we were getting into. She would go onto play the rest of her life. 1996 was the first time Alex competed in running. At an event called field days she was to be the runner. Alex was so nervous she had her Dad (me) go to the event and yell when she needed to speed up. Needless to say I never had to yell. Even at young age with no training she had great form and endurance. Alex had a small part in the high school play this year also. Alex would go to middle school. She continued to play soccer but also started to play basketball. Her grades were still straight A’s and she would be at the top of her class. Some of her activities were basketball, band, soccer, play flute in church, teach clover buds be involved in 4-h.
Alex would leave 8th grade at the top of her class and also was named American Legion Girl of the Year. Alex started Bentworth High school. The summer started with 4-h getting ready for the fair. Band practice and Soccer practice. Bentworth did not have a girls soccer team so she would have to try out for the boys team. This wasn’t anything new for her she always excelled playing the underdog. On her first band appearance at the high school football game she lost her band hat and was extremely distressed about it. A fellow soccer player Andrew Szuminsky save the day for her by giving her his. Alex not only made the soccer team but she was a starter. Very impressive for a freshman to make the starting team let alone a girl. She proved she was worthy of the honor and was able to achieve the respect from her fellow teammates. If you want to get an understanding of how much she loved soccer you can read the story she wrote about the ultimate game. Bentworth played the undefeated Chartiers-Houston. They did not advance to the playoffs, but she was looking forward to the next season. After soccer she went into basketball. Not being the best player she struggled playing the game. Alex would not give up. Mid way through the season the coach decided to put her cover one on one with the best player on the other team. She soon earned the nickname the glove. Whom ever she would cover they would get really agitated at Alex. During basketball Alex was also involved in the high school play. After games she would stay and practice for the play. After basketball and the play it was time for high school track and community soccer. Track was all new for Alex and Bentworth. It was the first year that Bentworth would compete at the WPIAL competition. After trying different events she found that the 400 800 and 1600 meter were her best. Every track meet Alex would get faster and faster. When came time for the WPIAL try outs she was a bundle of nerves. She had no problem making the finals. The next week were the WPIAL finals. The day of the finals the school decided to have her tested again for gifted. Needless to say with the biggest track meet in her life on the same day she did not pass the gifted level. It was a rainy day and the meet had several delays. Alex just sat in the bleachers, not talking waiting for her turn. When the gun went of so did Alex. With in the first half lap she had a impressive lead. 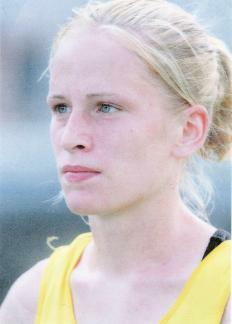 She set a WPIAl District 7 record that day in the 1600 meters. Alex came in second next to Ali Briggs. Next was the State finals. Friday was the preliminaries and Alex was nervous again.